Let me say that I was one of the many people complaining that last year’s album “The Money Store” felt too conventional. Sure, it had some of the best songs the band has recorded, and it still felt like genuine Death Grips, but there was that worry that signing to a major label had influenced the band to gravitate towards more radio-friendly hip-hop. Well, we were proven wrong later that year by “No Love Deep Web,” as the band leaked the album online just to spite EMI (and the famously explicit cover image). 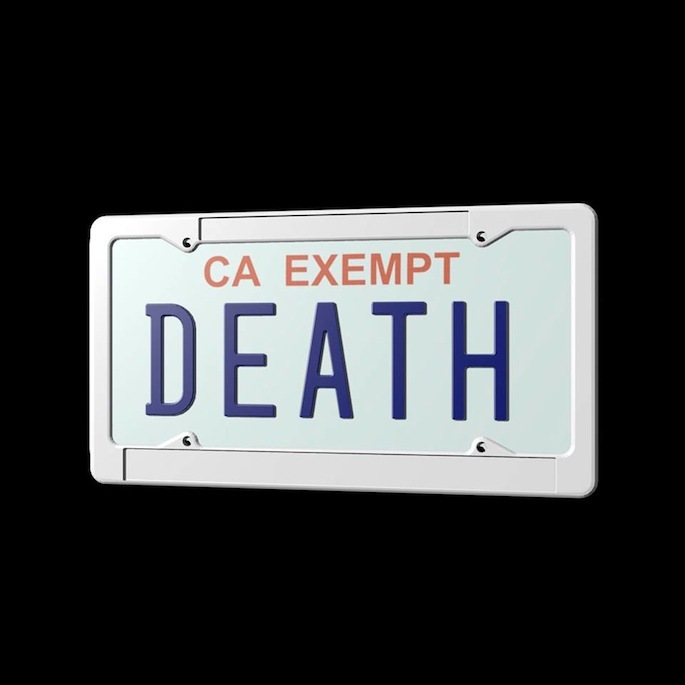 Well “Government Plates” is the most experimental album they’ve done yet – but it goes in the other direction. For the first time, MC Ride and Zach Hill take a back seat to Flatlander. The music is the focus on this album, and while it’s still urgent and shocking, it doesn’t exactly feel necessary. My favorite Death Grips song is “Blood Creepin’,” the last song on their original (and perfect) mixtape “Ex-Military,” pretty much because it’s their loudest song. MC Ride’s scream-rapping over Flatlander’s alternately pretty and distorted synth is just a pure assault on the ears. There’s no assaulting on this album. MC Ride is barely present on some songs. It’s all about the experimentation, and Flatlander does a decent job staying abrasive without ever treading into EDM or anything, but the band could’ve pushed a little farther. The opener, whose title is taken from Bob Dylan’s “Leopard Skin Pill-Box Hat” is so drenched in a synth rhythm that it’s impossible not to dance, with your mouth on the floor. But the next song, “Anne Bonny,” just doesn’t live up. For the first time, the album feels centered around a few songs instead of a cohesive effort. The pre-released “Birds” is certainly a stand out, subtle but the most experimental song on the album. And they end strong, with the winding “Whatever I Want (F**k Who’s Watching).” But the songs in between should be better. They’re never bad – they’re just sort of there. The best example of how different this album is would be the song “Big House.” The song starts with a loopy, 80’s synth rhythm. Despite being under two and a half minutes, MC Ride doesn’t show up until the :52 mark. There’s a lot more music on this album, as the group further continues to question what it means to be a hip-hop band. It was inevitable that they would investigate the other side of the spectrum. MC Ride and Zach Hill being less of a presence on this album feels very intentional, because it’s just as challenging as anything they’ve done before. While it’s not challenging on the ears, it shakes the very foundations of hip-hop by having the frontman often take a backseat, and to have songs drop senses of rhythm for experimentation. That said, I’m really not on board with the lack of Zach Hill on this album. He’s barely present. He’s easily one of the best drummers working today, and he could’ve done some very original work on this album, but there’s so little percussion. It has yet to be announced if this is an actual Death Grips album or if this is the soundtrack they’ve allegedly been working on for Zach Hill’s film. Frankly, it could go either way. It almost feels like a soundtrack – it’s got a slight disconnect amongst the songs, with a strong beginning and end – but it’s a good listen no matter which it is. I can’t say Death Grips fans will love it on first listen, and I didn’t. But it might grow after some revisits. It’s just as different as everything they’ve done prior to now – they’re making the same statements. It isn’t quite as enjoyable, but it’s certainly not bad. They’re not songs you’ll be singing to yourself, they’re not songs that EMI would approve of, and they’re head-scratchers. And really, that what Death Grips is striving to be. The album doesn’t play out like it hopes to, and it’s more unmemorable than memorable. It’s still Death Grips, though, and by this point, I don’t think I could live without them.